The new Ortega RCE138-T4BK is an extension of the successful Feel Series. The guitar is made with a solid spruce top and comes with a mahogany back and sides. T4BK stands for "thin line", "14th fret heel-to-body connection" and "black". This thinline model has a body depth of about 85mm and is equipped with a curved fingerboard (380mm). 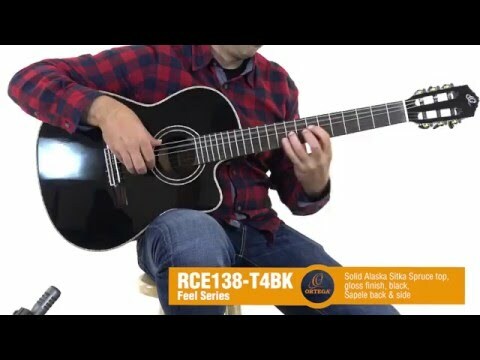 The RCE138-T4BK has an 12-hole bridge, which leads to an improvement of sound and tuning stability and ensures a faster response of the top. Another new feature is the new Ortega MagusPro electronics.